SCVHistory.com LW2413 | U.S. Highway 99 | Weldon Canyon. Weldon Canyon on the new U.S. Highway 99, looking north toward the area that would become Valencia. Real photo postcard, 1930s. Front reads: Weldon Canyon Near Newhall-Saugus, Calif.
On the back, in an unknown person's handwriting: "This is a view of Cal State Route 99 north of Los Angeles toward San Francisco looking north." Before 1930, US 99, which incorporated the Ridge Route, followed the general route of Sierra Highway to its intersection with the "northern" San Fernando Road. Today, it is difficult imagine how these mountains were a major barrier to road construction, but it is important to bear in mind how significantly the construction of the two freeways altered them. Building a road which would provide more direct routing for US 99 was not possible until the late 1920s, when both road building technology and funding had sufficiently advanced to permit it. 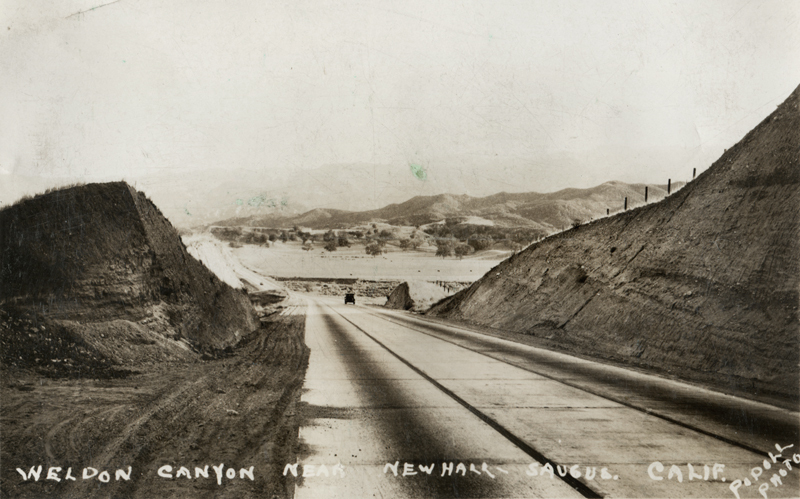 The Weldon Canyon bypass (officially known as the "Newhall Alternate"), which is now covered by I-5, was completed in 1930 and offered a substantial saving of time as well as increasing safety. Until its widening in 1951, this road was three lanes, with the suicide lane in the middle. North of the US 6 interchange, US 99 entered Weldon Canyon. Weldon Canyon is a stark contrast to the barren mountains that surround it and even though much of it has been paved over by present I-5, the lush vegetation that dotted its hillsides is still visible. Before 1928, this was a steep canyon, filled with vegetation reminiscent of someplace in the Pacific Northwest. The first road to cross it was only three lanes wide and hugged the western wall. It was widened into a four lane divided highway by 1953, but generally followed the previous alignment, which was engineered well enough to be incorporated into the newer highway. In fact, much of the widening work done in the 1940s and 1950s used the older alignments as half of the divided and widened road. The section between the I-5/SR-14 interchange and Lyons Ave was one of the last sections of US 99 to be replaced by I-5, having been bypassed between 1967 and 1972. Much of this highway still exists and is known today as The Old Road. LW2413: 9600 dpi jpeg from original RPPC purchased by Leon Worden.